(Truly) – In all these years, the beverages we’ve shared the most are definitely coffee and beer, depending on the time of day. We are an artistic collective called Truly. We also have a studio called Truly Design. We are based in Torino, Italy, and are all around 35 years old. It comes from our graffiti crew name (in wilder times, it used to be The Droogs), which was tweaked to Truly Design a few years later, when we were all hyped about involving other graphic arts in our walls. We later shrunk it further to just Truly, simply because we truly love what we do. -How do you define yourselves? Artists? Street artists? Anything else? Definitions and other such technicalities mean very little to us. Communication and artistic exchange are way too fast for it to make sense to draw lines between trends and genres, and if you think about it it’s not like drawing lines actually accomplishes anything or helps anyone, right? 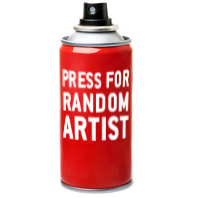 So we use the very generic term “Urban Artists”, which is just there to indicate that what we do derives from the mega mix which has been going on in the urban art world over the past couple of decades. Undefinable, but definitely not from the grasslands. Even though we love grasslands. We started off as a graffiti crew in the late 90’s, doing mostly trains and legal walls. Very little tagging or street bombing. After a few years of painting mainly letters, we felt that the graffiti writing/street art aesthetics were a little too tight for us, and furthermore scarcely representative of a bunch of Italian kids from the 90’s. So we started mixing in all that we found interesting and inspiring, from classical art you can check out at the Uffizi Museum all the way to modern graphic design and contemporary illustration. And then, one day, we discovered anamorphic art, and the endless mind trip began. It’s now what we are completely dedicated to as an artistic collective. We continue painting in halls of fame on weekends, of course. Feed stuff, may it be dogs, cats, or babies. Then espresso! We all sense that electronic music is the genre which overall relates best with our anamorphic work. It’s scientific, calculated, made with machines, precise to the millimeter, modeled and re-modeled, yet it expresses the imperfect realm of human feeling in its own unique way. Just about anything we like, including non-visual art forms like music. Generally speaking, we come from the huge treasure trove of ancient and contemporary culture that is Italy, and it’s virtually impossible to operate in a naive way in respect to our history. And this continues during our travels. I guess it all comes down to curiosity and not the objects of curiosity. Everything that comes before actually working on it: finding a cool spot, a client, or any other situation which will allow you to express yourself at your best. I’m not saying that creating artwork is easy, but it comes so natural for us that, even when working on the trickiest parts, we do not necessarily perceive the difficulties we encounter at their fullest. Collectively speaking, we all have a profound admiration for Leonardo Da Vinci, who would introduce himself as an inventor, engineer, and so forth, leaving painting for last as a mere hobby of his. The matter is whether his was artistic arrogance or if he was acknowledging art as a mere commentary of more profound forms of knowledge. Let’s leave Italy aside for a while. Definitely New York blew our minds. It’s like traveling to Mecca for a graff artist. Then of course London, Paris, and all the other big cities where we can see where Urban Art has gotten to. I guess music and travel are the common things, then each one of us loves the most diverse things. No one big project, but a few different ideas which are on hold until the right project comes up. Nowadays it’s hard to cling on to epic ideas for more than a few months: you rethink, you update, you erase, and change ideas constantly. The stimuli are really a lot. We have been working on two series over the past few years. The first is figurative, calling ancient mythology into action. We’re fascinated by how certain stories have been told so many times that they morphed directly into something else. The second series is strictly abstract geometric design, more of a formal investigation on the relationship between flat geometry, three-dimensional elements, and the surrounding architecture the artwork is actually painted on. From a few days to permanently. In the first case, it’s a graffiti hall of fame, in the second a commissioned indoor piece. They have no idea as to what it is. I guess it looks like randomly colored surfaces. They don’t know whether they should pretend to know what they’re seeing and say “good work guys” or just look puzzled and walk away. But when they see it from the right point of view, they’re blown away. Only two of us ever got busted for graff. To continue enriching our artwork with a little something at each step, and to continue working abroad, as travel is one of our biggest stimuli. Enjoy life and ignore boundaries! -Thank you for your time and sharing your thoughts with us – Your works are a source of inspiration and admiration! Check out more works by Truly here.